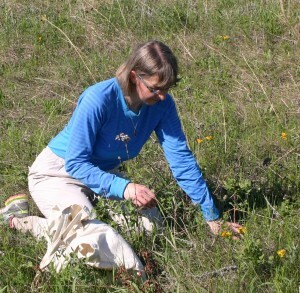 Dr. Bizecki Robson obtained a Master’s Degree in Plant Ecology at the University of Saskatchewan studying the rare plants of the mixed grass prairies. After a few years of working as an environmental consultant and sessional lecturer, she got her Ph.D. in Soil Science from the same University, this time focusing on phytoremediation of hydrocarbon-contaminated soil using native and naturalized plants. Diana joined The Manitoba Museum team in 2003. At the Museum Diana has continued her research on endangered prairie plants, documenting their distribution, habitat and ecological relationships with other species, including pollinating insects. Her current research is focused on prairie pollination and the conservation of wild crop pollinators, like bees and flower flies, in agroecosystems using wildflower plantings. When she has time, Diana also collects fungi, lichens and mosses to document their distribution and habitat needs in Manitoba, and assess their rarity. Robson, D.B., J.H. Wiersema, C.B. Hellquist, and T. Borsch. 2016. Distribution and ecology of a new species of water-lily Nymphaea loriana (Nymphaeaceae) in Canada. Canadian Field Naturalist 130(1): 25-31. Robson, D.B. 2015. Plant-pollinator matrices: Applications for prairie restoration. Canadian Reclamation 15(1): 18-22. Robson, D.B. 2014. Pass the salt shaker! Manitoba salt-loving succulent red samphire. In: The 2015 Prairie Garden: Grasses and Succulents. Edited by: R. Denesiuk. The Prairie Garden Committee, Winnipeg, MB. pp. 103-104. Robson, D.B. 2014. Identification of plant species for crop pollinator habitat enhancement in the northern prairies. Journal of Pollination Ecology 14(23): 238-254. Robson, D.B. 2014. Mutualistic and antagonistic networks involving the rare silky prairie-clover (Dalea villosa var. villosa), and its co-flowering plants and insect visitors. Botany 92(1): 47-58. Robson, D.B. 2013. An assessment of the potential for pollination facilitation of a rare plant by common plants: Symphyotrichum sericeum (Asteraceae) as a case study. Botany 91(1): 1-9. Robson, D.B. 2011. Rarity Status Assessments of Bugseeds (Amaranthaceae: Corispermum) in Manitoba. Canadian Field Naturalist 125(4): 338-352. Robson, D.B. 2010. An analysis of the distribution, ecology and status of bugseeds (Corispermum) in Canada. Canadian Field Naturalist 124(3): 246-255. Robson, D.B.2010. The bugseeds (Corispermum) of the Prairie Provinces. Blue Jay 68: 199-207. Robson, D.B. 2010. Reproductive ecology of the western silvery aster Symphyotrichum sericeum in Canada. Endangered Species Research 12: 49-55. Robson, D.B. 2010. A comparison of flower-visiting insects to rare, Symphyotrichum sericeum and common, Solidagonemoralis (Asteraceae). Botany 88(3): 241-249. Robson, D.B. 2008. The saltbushes (Atriplex) of the prairie provinces. Blue Jay 66: 211-225. Robson, D.B. 2008. The structure of the flower-insect visitor system in tall-grass prairie. Botany 86(11): 1266-1278. Robson, D.B. 2008. The prairie goosefoots. Blue Jay 66(2): 82-95. Robson, D.B. 2006. Status of Smooth Goosefoot, Chenopodium subglabrum (Chenopodiaceae) in Canada. Canadian Field Naturalist 120(3): 335-341. Robson, D.B. 2006. Flies: Nuisance or necessity. Blue Jay 64(2): 84-96. Robson, D.B., J. Greenall, C. Hamel, C. Foster. 2005. Smooth goosefoot rediscovered in Manitoba. Blue Jay 63(2): 81-84.